It's pretty easy to say that John Goodman (plays "Howard") carries this movie for the most part. Goodman continued to show different dynamics of his character that would constantly make you think, "What's this guy's deal?". He was by far the most intriguing character despite the fact that Mary Elizabeth Winstead ( plays "Michelle") is the obvious lead. Similar to the previous Cloverfield film, the movie continues the same approach of keeping a level of mystery until the latter part of the film. The good part about this is that you become invested into the film because you don't know any more or less than the main character. There are some moments that are genuinely suspenseful and thrilling. Given the fact that you're kept in the dark about who the characters are, the film really does keep you in the moment from scene to scene. You have no idea what may or may not be actually happening in the outside world either. There are just enough twists and turns to keep you wondering about what will happen next. 10 Cloverfield Lane isn't really a sequel per se. Unless I missed something, it felt like a stand alone film that happened in the "Cloverfield universe". When you see the end of the film, you'll be able to see how the two films connect. This movie is more of a thriller than it is a sci-fi flick. I'd say it's more of Misery + War of the Worlds, or something like that. Unfortunately, I can't really say much more without giving too much away, so I'll just say that this was enjoyable and worth the watch. 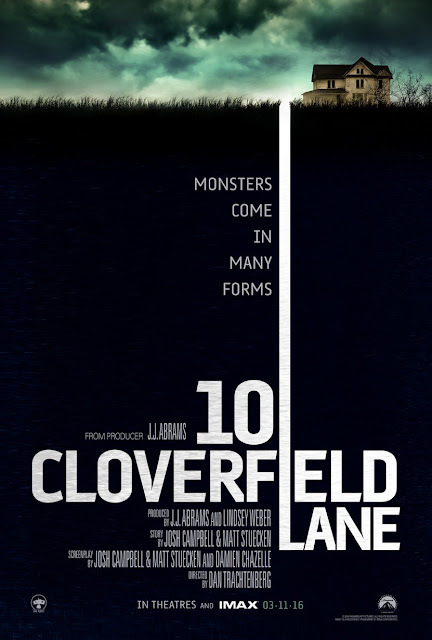 I think that if you liked Cloverfield then you'll more than likely also like 10 Cloverfield too. It's not something you'd have to rush to the theaters to see. If/when you do decide to see it, I don't think many people will be disappointed.